Click on any of the slides below to expand them to full screen, or use your browser’s zoom feature. You can also download a PDF version to save or print (bring it along with you at your next live poker event!) by clicking on the icon to the right. Some poker players love math. They calculate the odds of complex hand situations just for fun. Others have flashbacks to high school algebra and loathe the whole process, preferring to rely more on situational decisions, reads of players, and instinct. Even the most resolute mathphobe needs to commit to memory a few key odds so that they can make good bet sizing and calling decisions. 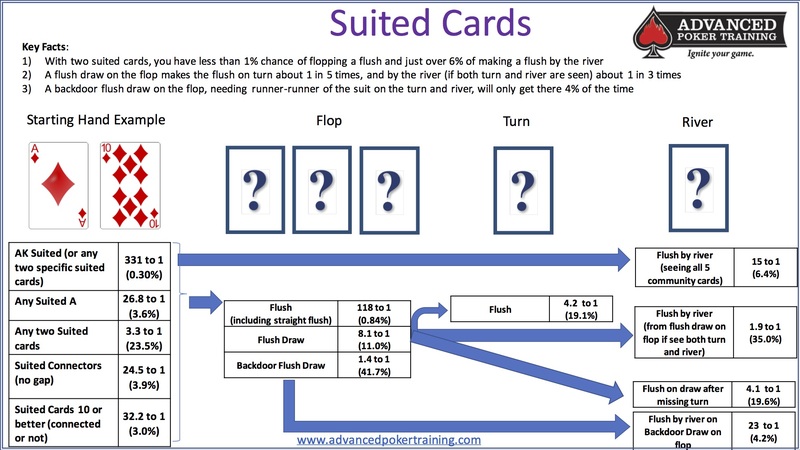 The diagrams below summarize key odds that every player needs to know, from the odds of getting certain starting hands to how those hands can play out over the flop, turn, and river. 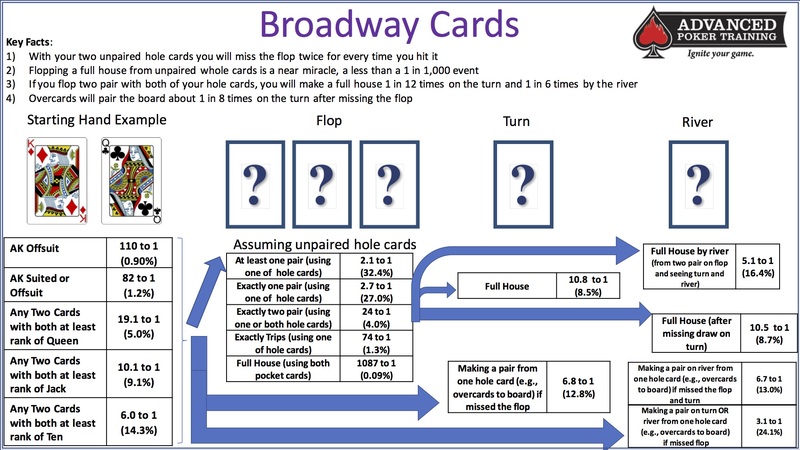 These odds are grouped according to the most critical hole card combinations: Pairs, Suited Cards, Connected Cards, and Broadway Cards. 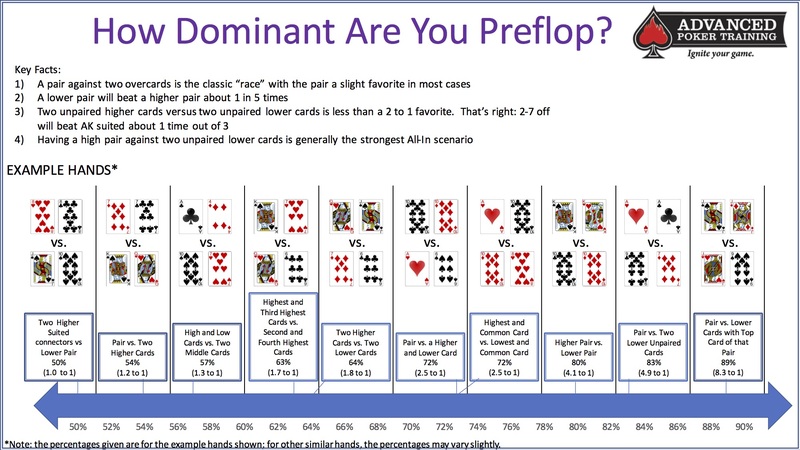 However, many of these odds are applicable to wider situations: the odds of pairing 8-3 off-suit on the flop are the same as pairing A-K, so you can apply the odds we present for Broadway cards to other non-Broadway holdings as well. Of course, if you are voluntarily entering pots with 8-3 off-suit very often, we should have a broader discussion! How often should you look down and see a pocket pair? 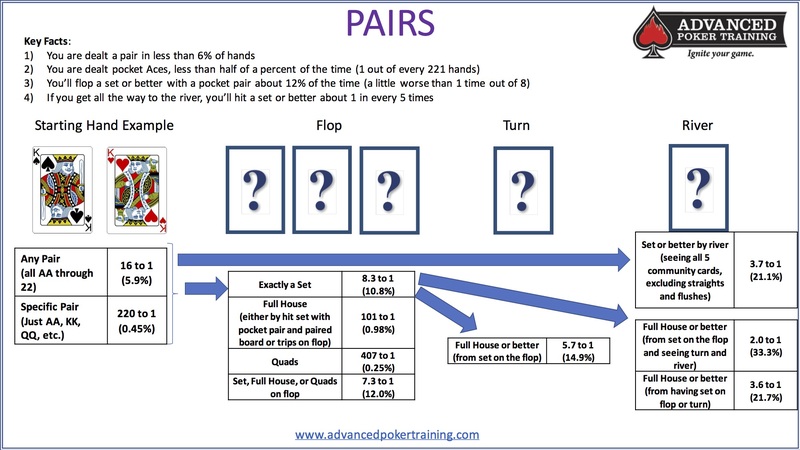 Just how difficult is it to flop a set after you do get a pocket pair? Let’s get greedy now: how about the odds of that set turning into a full house by the river? Those suited aces and suited connectors look so pretty, but just how valuable will they prove to be? How often will you flop a flush or at least a flush draw? If you have that draw on the flop, how often will that flush come to fruition on the turn or river? Hitting a straight can be a very profitable situation as these are often better disguised than made flushes. 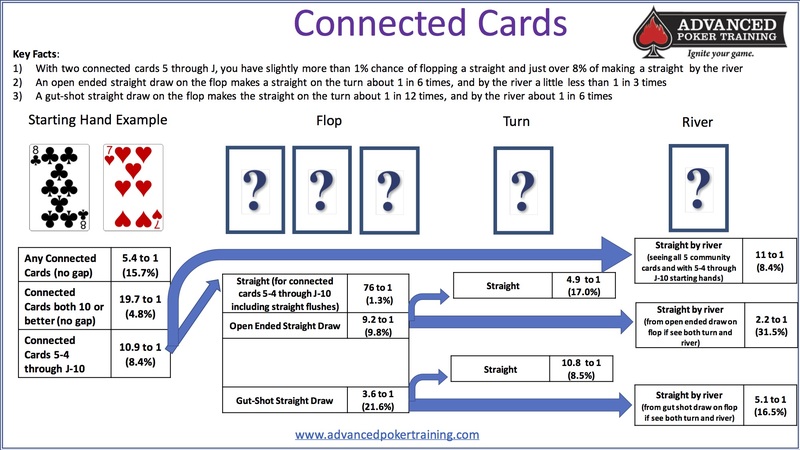 Getting connected cards, particular ones that are in the range of maximum straight possibilities are fairly rare, and achieving straights even by the river are not common. Just how rare? Take a look above. “Just a couple of face cards please!” You’ll hear this plea from card dead opponents frequently. By just how likely is it that you’ll see two Broadway cards in your hand? How often will one of those, or any two cards, pair the flop? Or better yet, how often will both pair the flop? It’s late in a tournament, your stack has dwindled to under 15 blinds and you’re looking for a hand with which to shove. If you get called, are you going to be in a classic “race” with a 50/50 chance of survival? Or will you find yourself “dominant” with an 80% or better chance of victory? How far behind might you be if your opponent wakes up with a big hand? See above for the types of situations you’re likely to find yourself in.